Yet another root beer with a name that is so similar in theme to many others that it's hard to differentiate this root beer from like ones when only mentioning the brand. Old Town Root Beer 66 is a root beer that came to me via my friend Richard in California. The Old Town Root Beer shop is near his house out there and he sometimes stops in and finds me things to review. The shop has been around since 2000, and i am assuming they have been brewing and selling their labels of root beer for just as long. This root beer is easy enough to forget on name alone. I think i've reviewed an Old Town Root Beer (brewed by the same company), a Route Beer 66, a Root 66 Beer, and some other ones that are similar in many ways. It's hard to keep them all straight. All i can really pull out from my foggy memory of them is that Root Beer 66 is disgusting. I think i rated it a 1 or a 2. You'll have to go back and check, but for goodness sake please don't drink it. Anyway, this root beer is cashing in on the Route 66 theme, which is something i detest having grown up in a tourist town along Route 66. The place was so littered with Route 66 merchandise that it was laughable, not unlike the scene in this pic. Now the whole road is lined with roadside attractions for small towns to prey upon travelers. Not sure what prompted Old Town to brand a version of their root beer under this name, but here it is in all it's fabulous lack-of-glory. Just a word of advice to anyone in the root beer game... just because "route" and "root" are homonyms doesn't mean people should start interchanging them to sell goods and services. It's stupid, so knock it off. Now if you'll excuse me, i have a dental appointment for a scheduled route canal. This 12 oz dark brown glass bottle is dressed with a stylish enough label. It's something a little different from the normal themes we usually see. It is structured under the iconic/played out Route 66 road sign graphic with a map of the continental United States showing the path that Route 66 carves all the way from Chicago to Los Angeles across our great country. The map even lists several of the more prominent cities it passes through (my hometown is excluded of course, but nearby Flagstaff made the list). It's weird to think for how long the road is it only inhabits 8 of our 50 states, but most of the states it does cross are some of the larger states in our nation in terms of land mass (Texas and California being among them). 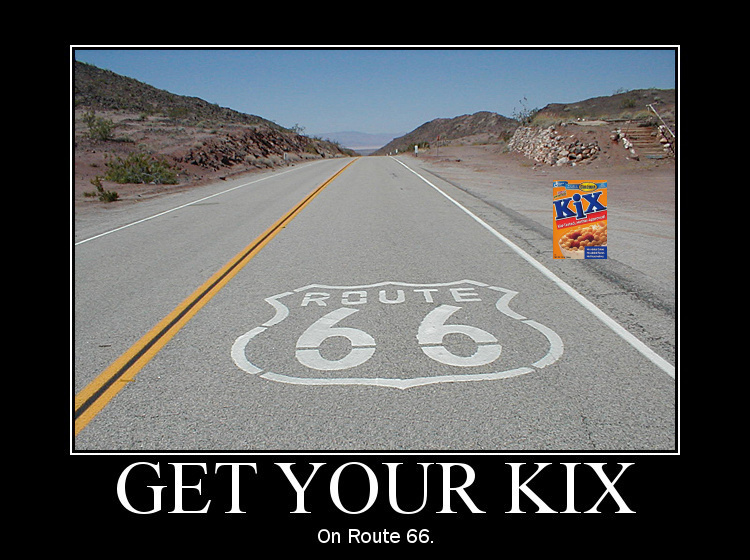 Several tag lines are listed on the label as well, such as "Get to the root of Route 66", "The finest root beer on the route", and "Get your sugar fix on Route 66". All of these irritate me, but the last one especially since it's a play on the old trope "Get your kicks on Route 66". I really don't see a need for all these tag lines. Are they just testing them out? Well guess what Old Town, we don't care. Just pick one. It doesn't matter which one cuz they are all terrible. Knock it off (that's twice now i've told you to knock it off). As angry as the theme of this root beer makes me, i can't say much bad about the taste other than it's pretty standard and nothing special. It's not gross or bad by any means, but lacks a good aftertaste and fades fast. It's sweetened with cane sugar for those of you who care and it has a hint of honey so small that i didn't detect it until i read it on the ingredients and specifically tried to pay attention to tasting it. The carbonation was adequate and the overall experience was something i'm about as eager to revisit as i am my hometown. My official review is that Old Town Root Beer 66 gets 5 (five) IBCs. This root beer is perfectly average at best. It deserves less praise than i am giving it, but as a fair judge and reviewer of root beers i have no reason to dissuade my readers from trying a refreshing root beer when it's available. It tastes fine. I don't want to kill myself after drinking it. But let's all just please agree that the golden age of the Route 66 is dead and gone. This road should have the same connotations as the Trail of Tears; a shameful embarrassment for our country during a misunderstood time long ago. So let's all just pretend it didn't happen.